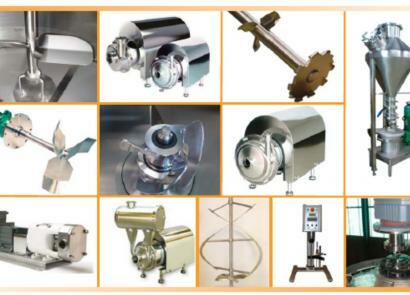 Complementary to the range of vessels and agitators, Pierre Guerin designs, manufactures and distributes a wide range of process components including the POLYMEL blenders, the Packo PCP sanitary centrifugal pumps and the alm laboratory homogenizers. Central to the range of process components, the POLYMEL blenders represent the ideal solution for any process that requires the dissolution or the pre-dispersion of large quantities of powder (Up to 9 500 Kg/h) into liquids. For the transfer of raw materials and finished products, Pierre Guerin offers a complete program of sanitary centrifugal PCP with the best Price / Quality ratio in this market sector. Featuring a unique patented 10 stage ultrasonic homogenization head, the alm laboratory homogenizers provide customized homogenization of sensitive products. The smoothing of food products (fresh cheese, fruit purees, dessert creams, sauces, etc.) performed via the Lissalim machine is one of the numerous applications developed by Pierre Guerin from the alm homogenizer range. As a European leader in vessel manufacturing, Pierre Guerin has also developed a set of specific and innovative vessel accessories, including the RO ultra-clean vents, the NPP wall-mounted cleaning devices and the PE sampling devices. All these components are designed to comply with the highest sanitary and hygienic requirements such as 3A, EHEDG and FDA.